Dewey's Auto Body offers a full service car detailing experience. The Dewey’s Auto Body detailing department can help you maintain the life of your vehicle’s paint along with the appearance of the exterior and interior of your vehicle. You spend a lot of money on your car, let us help make sure that it keeps its value. 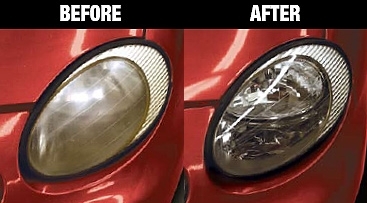 Just think, if we can do this to your headlamp, just imagine what we can do with your whole car. Keep your family safe by improving your nighttime visibility.